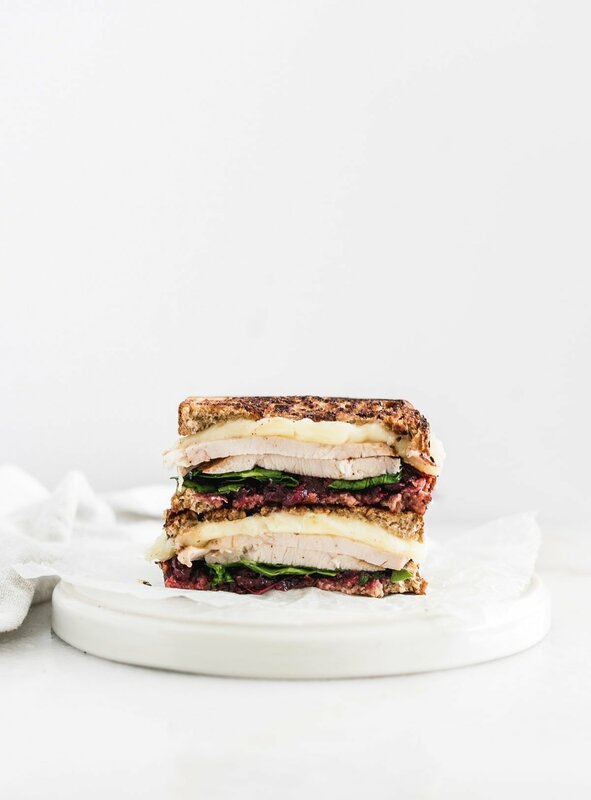 This simple and delicious Turkey, Cranberry and Brie Sandwich is a great way to use up those Thanksgiving leftovers! Are you a leftover lover or leftover hater? I am definitely a leftover lover. It is very rare that any leftovers get thrown away in our house. But I think one thing we can all agree on is that Thanksgiving leftovers are THE best. Even if you’re a leftover hater, I bet you still love Thanksgiving leftovers, huh? One of the great things about leftovers is that you get to transform them into something completely new without having to cook a whole meal again. You know, just in case you hate eating the same thing for a week. Which in the case of Thanksgiving leftovers, I will gladly eat them for an entire week. Because Thanksgiving food is the best food. End of story. But just in case you don’t love turkey and dressing for a week straight, here’s something else you can make with your leftover turkey and cranberry sauce. A delicious, 10 minute Turkey, Cranberry and Brie Sandwich. Yum. Is it cliché to make a turkey sandwich with leftover turkey? Maybe. But I don’t care. 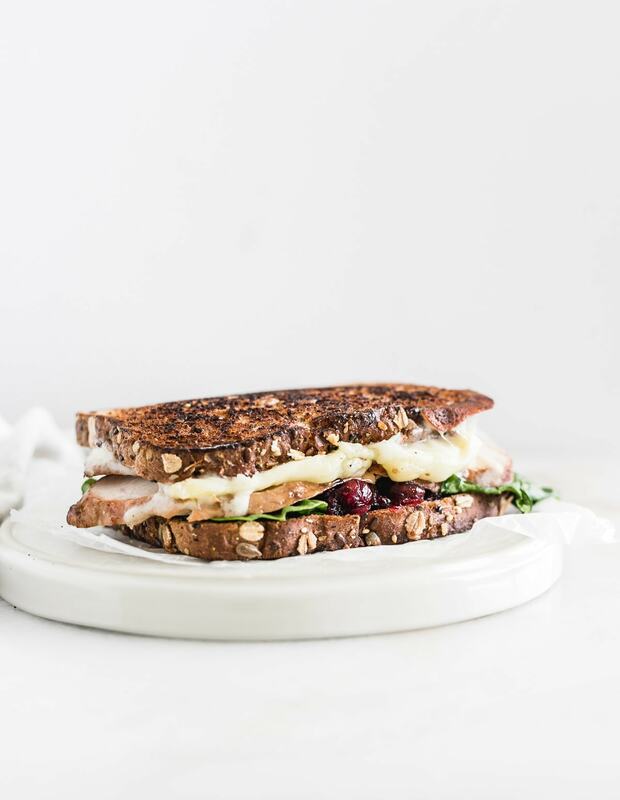 The combination of warm turkey with melted brie and sweet cranberry sauce on sourdough bread, with just enough spinach to give it some veggie cred, is one awesome sandwich. You know I don’t mess around with sandwiches that aren’t awesome. (No melty cheese, I’m not interested.) Also for somebody who doesn’t like brie that much, I sure am using it a lot lately. It must be the cranberries. So just to recap: Thanksgiving = awesome. Thanksgiving leftovers = awesome. 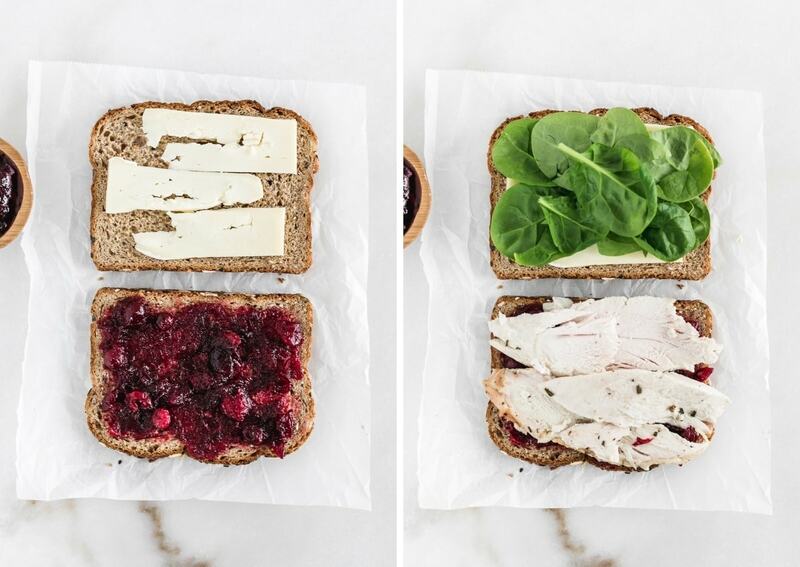 This Thanksgiving leftovers Turkey, Cranberry and Brie Sandwich = awesome. Wishing you and your family a Thanksgiving full of awesome! Place sourdough on a baking sheet. Divide brie between two slices of bread. Place turkey on top of brie. Place in the oven and bake until cheese is melted and turkey is warm, about 10 minutes. Remove from oven. Spread cranberry sauce on remaining two slices of bread top each with spinach or spring mix. Place on top of bread topped with turkey and cheese. Enjoy!